This is another Harry Hole thriller from Jo Nesbo. There’s a clear chronological order to the books in this series – this one is the fifth and comes after his partner Ellen has been murdered. Harry is pitched against his nemesis Tom Waaler in an investigation into another serial killer. As well as the excitement of the plot, Nesbo graphically depicts Harry’s fall into alcoholism as it threatens to destroy his relationship with Raquel and his career. The good news, though, is that this book isn’t as grisly as some of his other works. The quality of writing by Jo Nesbo (or possibly the translator?!) hits you as soon as you begin his books – this one is every bit as good as The Redbreast. Whilst some of the Harry Hole books are grisly, this one doesn’t rate too high on the bloodthirsty scale (although one incident with a vacuum cleaner isn’t for the squeamish). 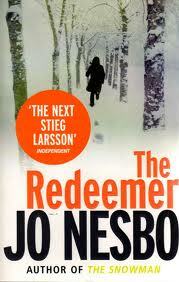 This is the best book by Jo Nesbo that I’ve read. It stands out due to the quality of the back story that he tells, set during World War I. It’s also set early in the timeline of the lead character, Harry Hole, and includes how he met Rakel (who features heaviliy in other stories including The Snowman).